Today being a Sunday and there not being a whole lot of stuff to do, Tim took us to Lord’s Bridge to show us round the telescopes there. He took advantage of it being a friends and family day so we got a guided tour of the site by Rosie, Bodie and for some of it Tim himself. It was my first time there and I drank in the sight of the huge white telescope that greeted us as we entered. Lord’s Bridge takes it’s name from the old abandoned railway station that once linked Oxford and Cambridge. 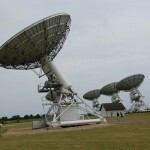 It’s a wind swept flat ex-MOD site that is now home to a mixture of decommissioned and functioning telescopes. When you enter the site there is a new looking recently repainted telescope that is owned by Manchester University. 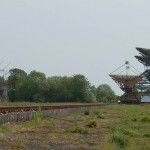 It links up to the telescopes at Jodrell Bank. You then follow the road round to find some defunct telescopes amongst which is the the 4-acre Array where the first pulsar was discovered. It just looks like a bunch of posts in a field. 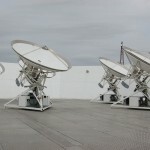 Originally wires were strung between them and this set-up acted like a giant dish to collect data. The now overgrown grass once had sheep grazing underneath to keep it short and out of the way of science. The area is now weed covered and under the 4C Radio Telescope wild orchids and strawberries grow amid the grasses and crow picked rabbit skulls. Bodie showed us the only optical interferometer telescope on site, the rest being radio interferometer telescopes. Mirrors, tubes and a bunker were all carefully explained. The telescope is actually a prototype for the telescope at the Magdalena Ridge Observatory in New Mexico. We ended the tour with a look at the AMI small and large Array that Tim works on. These white telescopes hummed and moved in their mechanical search of the sky and our cameras clicked, while with satisfaction we all nodded to each other that this was what we’d come to see, these were telescopes we’d imagined. This entry was posted Sunday, June 5th, 2011 at 10:19 pm	and is filed under Education, Museums, Things to do. You can leave a response, or trackback from your own site.